You have seen Yuvraj Singh hitting six-ball six sixes against England’s Stuart Broad in T20 World Cup in 2007. 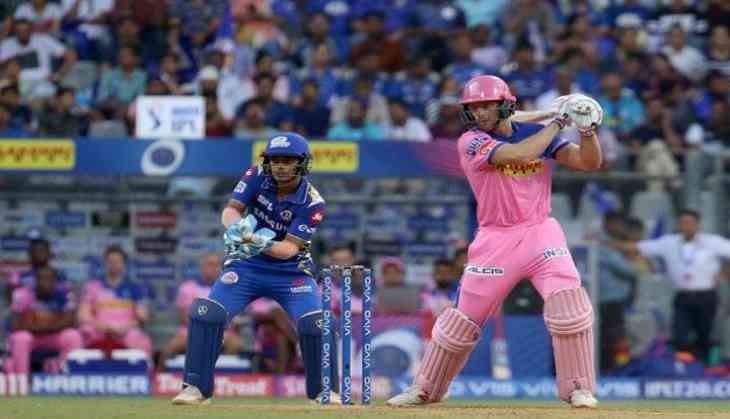 English player Jos Buttler hit Alzarri Joseph for six-ball six boundaries in the Indian Premier League against Yuvraj Singh’s Mumbai Indians. The incident took place during a match between Mumbai Indians and Rajasthan Royals. Alzarri Joseph was bowling the 13th over in the first innings of the match. Jos Buttler started the over with a six and then hit four consecutive boundaries. Buttler ended the over in style as he cleared the rope for a maximum. Joseph who registered the best bowling figure of IPL on his debut, went for 28 runs in an over. Buttler was at 61 runs off 36 balls at the start of the over and by the time the over finished he was at 89 off 42 balls. Rajasthan Royals went on to win the match by 4 wickets as they chased down the target in 19.3 overs. Jos Buttler was the highest run-scorer for the Royals as he scored 89 runs before being dismissed by Rahul Chahar. Buttler was awarded the man of the match trophy for his fantastic knock. Quinton de Kock was the highest run-scorer for Mumbai Indians as he scored 81 runs off 52 balls. Rajasthan Royals are sitting at number seven on points table as they have four points to their name having won just two out of the seven matches they played. Royals will face Kings XI Punjab for an away match on April 16 at IS Bindra Stadium. Shock to Sushant Singh Rajput, MS Dhoni biopic sequel will not be made; know why? READ NEXT >> Shock to Sushant Singh Rajput, MS Dhoni biopic sequel will not be made; know why?